While the cowboy hat is one of the most beloved items of western wear, there’s more to buying and wearing cowboy hats one than just putting it on your head. The first Rule that is indisputable and critical, is DO NOT mess with a cowboy’s hat. A cowboy hat is a very personal, and sometimes very expensive, item that you don’t pass around. In some places, to touch a man’s hat without permission will get you hog tied to a tree so you just don’t do it. Out on the range however, keep your hat on while you eat. If you take your hat off, another wrangler might step on it or spill food into the rim. Originally felt hats were intended for winter wear (protecting from moisture and cold) and straw for summer (protecting from heat and sun) which is logical. An arbitrary fasion rule is supposedly that felt is worn between Labour day and the May long weekend, and straw in between. The reality is that both are seen at either time of year depending on the weather at the time of wearing. If it’s super hot, maybe a straw would be better than a black hat. If it’s a cold night, a straw might be too chilly on the head and felt would be a more comfortable choice. Then again, if it’s a formal event, I probably wouldn’t wear a straw no matter what. Let common sense be your guide. Now there seem to be two schools of thought on handling hats. One school says when putting on or removing your hat, hold the brim near the crown in the front and the back. Another school says to never handle by the brim, to always lightly grasp the crown. Essentially it boils down to this: Any handling which causes flexing or bending of the brim or crown will gradually weaken the body of your hat. The more severe the flex or bend, the sooner the hat will lose its natural ability to maintain its shape. Personally, I usually handle my hats by the crown albeit gently. I almost never handle them by the brim except to adjust them on my head, since this is a more easily disrupted structure. To Travel with a hat, some make use of Travel Hat Boxes with Handles. These are solid containers the protect the hat from physical and environmental damage, especially if it’s a more expensive hat. If I’m traveling and not wearing my relatively inexpensive hat, I simply carry it, albeit carefully, in a plastic shopping bag. During the National Anthem, Pledge of Allegiance, the Passing of the Flag, In Church, during a Prayer, an indoor Wedding, a Funeral (indoors) or at the "passing" of a casket in a funeral procession. Hold your hat in the left hand with your right hand over your heart. You may also hold your hat in your right hand, followed by holding your hat over your heart. Either way is acceptable. This should also apply to anyone who is your Elder or a "Man of the Cloth". In other words, the Clergy, Pastor, Priest, etc. When you begin a conversation with anyone; but not needed if your just saying "hello" as you pass them. It is generally considered, to always remove your hat while in a private home. * Unless others are wearing their hat/s. It is then considered to be at the blessing of your host or hostess. Always remove your hat by the crown. *Some people do use their brim, but the brim must be strong. Do not use the edge of the brim. Removing the hat by the crown is the most customary. Never lay a cowboy hat down on the brim. Place your hat on it’s crown, brim up. You may also use a hat stand or rack. Never show the inside of of your hat. The hat band, and the inside of the crown should not be in or for public view. Your hat should always be removed while dining in a restaurant. *Unless, you’re in fast food restaurant. Wear the right cowboy hat for the right season. Not only is it impractical to wear a felt hat in the middle of summer, it’ll make you look kinda silly, too. Felt hats will leave your head all hot and bothered, and spotting a felt hat in July is an easy way to separate the tourists from the true cowboys. Stick to straw hats once the weather heats up, and felt hats when it cools off. Buy the right cowboy hat size. Nothin’ looks funnier than a fella in a hat that’s the wrong size for him. Too big, and it’s liable to blow off in a light breeze. Too small, and you’ll look squeezed into the crown (and you’ll be uncomfortable to boot). 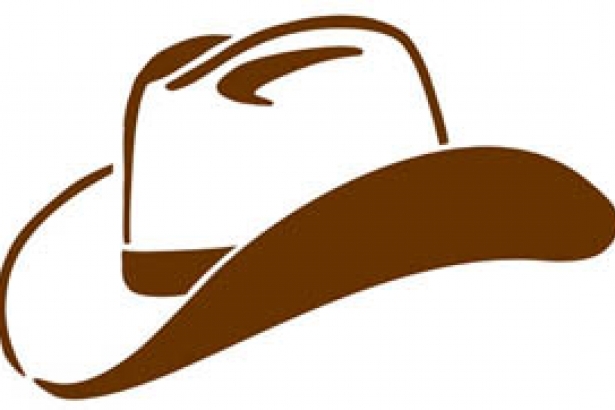 For guidance finding the right size cowboy hat, you can refer to our hat sizing chart. Hold your hat the right way. When you remove your hat, grasp it by the crown and hold it so that the lining doesn’t show. When you set your hat down, put it upside down.